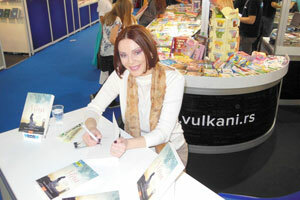 2/17/2014 — The Aramcon Marina Bulatovic Barny recently had her second edition of her novel, “Nina of Arabia,” released in December 2013, just a month after it was promoted at one of the most important international book fairs in Belgrade, Serbia. Barny, who has been living in Saudi Arabia with her husband since 2007, is originally from Serbia. “Nina of Arabia” is her first novel. Inspired by the life in Saudi Arabia, which she sees as her second home, as well as the memories from Serbia and by the city she has always dreamt of — New York. Barny brings to life a tale about a successful and happy woman in whom the Serbian spirit, the intoxicating smell of the exotic Orient and the irresistible charm of the Big Apple intertwine in a charming way. The promotion of this novel got the attention of numerous celebrities and VIP guests from the cultural and public life of Serbia, diplomatic representatives and the media; after publishing the second edition, Barny has been invited as a guest by the Mufti of Serbia, Muhamed ef Jusufspahi. “The message of my book, which takes place in Saudi Arabia, Serbia and the United States, is that the purpose of all people on Earth is to get to know and understand each other, and to live side by side in harmony regardless of their differences,” said Barny. “The majority of the characters are the people from my life — my family, husband, relatives, neighbors, and friends from Serbia, Canada (where my husband lived for about 15 years) and Saudi Arabia. “But the characters in my novel are also people who I look up to and whose work I respect and value,” she added, listing: • The Kingdom’s top leaders. • Nikola Tesla, a Serbian scientist, who lit up the world. • Princess Jelisaveta Karadjordjevi from Serbia. • Renowned American actor and producer couple Tom Hanks and Rita Wilson. “I have described the events from my past and present and how I see my future. I hope that people will have fun reading my novel on one hand and learn something about each other on the other — and that my first novel will contribute to developing mutual tolerance between people,” she said. “The beauty of our planet is that it is populated by people who are very different from one another. Imagine how boring it would be if everyone were the same.” Currently, the novel is also being translated to English and the author hopes to publish the novel in the United States, Canada, Saudi Arabia, UAE and Bahrain.